Training Treasures: "Yuckies, Yuckies in my Tummy . . ."
"Yuckies, Yuckies in my Tummy . . ."
Watch this post in action in my YouTube video! My boys and I had a blast with this rhyme we made up! I threw a little dramatic play in with it as well, and it kept my boys playing (and ultimately reviewing their phonetic blends) even longer! My oldest found this "fish bowl" gorilla toy at 5 Below for his 5th birthday. I wrote phonetic blends on the bottom of recycled K-cups and bottle caps. The gorilla has an opening in his back and in his mouth for kids to keep toys (or a Beta fish, as per directions, but we won't go into all the reasons that sounds like a very, very bad thing to do). I slipped the blends into the gorilla's "tummy" ahead of time, and we were ready to play! Note: The "bleh" was what did it for my 2 boys who love all things gross. I made the rhyme up in the car on the way home from church, and the boys were in stitches, making me repeat it over, and over, and over again. I was giggling right along with them, for sure! While playing the game, I added in a bit of dramatic play- asking the boys what a gorilla should have eaten (bananas), and we told them we need to do surgery to get the yucky blends out! They each reached into the gorilla's tummy, pulled out a blend, and had to read it to me. At the end of the game, we re-read the blends and put them back in the gorilla. You can easily change the words to fit other toys that would accommodate this game. If you have puppets, they would work too! Just slip a bottle cap blend in the puppets mouth and make the kids pull it out! Maybe you have a stuffed animal back pack? I know we have a couple of those laying around here too! Just switching up the toy will keep this game fresh and exciting for those little ones who tire of the same activity. We also played around with the words- instead of "funny" we used "crummy". You can say "yucky" instead of "yuckies", or change "some" to "a", if that suits you better! 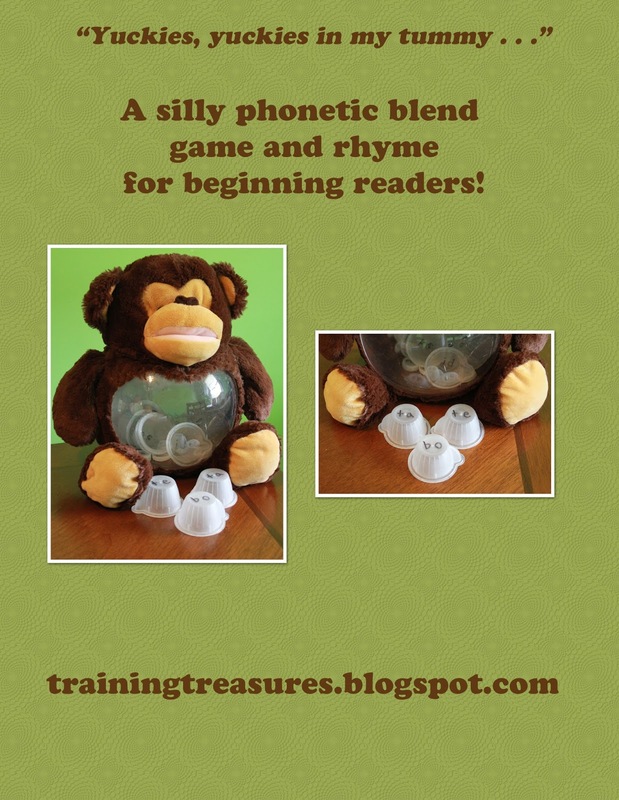 And if you aren't teaching phonics, who says you can't replace blends with something else? Like letters? Or what about words? Be creative! Your kids are sure to love this one! Monster, Monster, down by the lake . . .